Christian blogger Rachael Colby writes to minister and encourage others in the Lord. I met her on Twitter and she is a pleasure to know! Starting this past October, Rachael began a blog series interviewing a variety of pastors and wives to get an inside peek into ministry life. It’s been encouraging to read about what God is doing in congregations across the world and to find out how God has moved in the lives of his followers impressing upon them the call to serve Him in a pastoral role. There is the powerful story of Pastor Catala who went from Dope Dealer to Hope Dealer. Read to find out the miraculous way God saved him and his wife and what their ministry is like today. There is also A Preacher’s Kid Speaks about what it is like to be or raise a pastor’s kid. 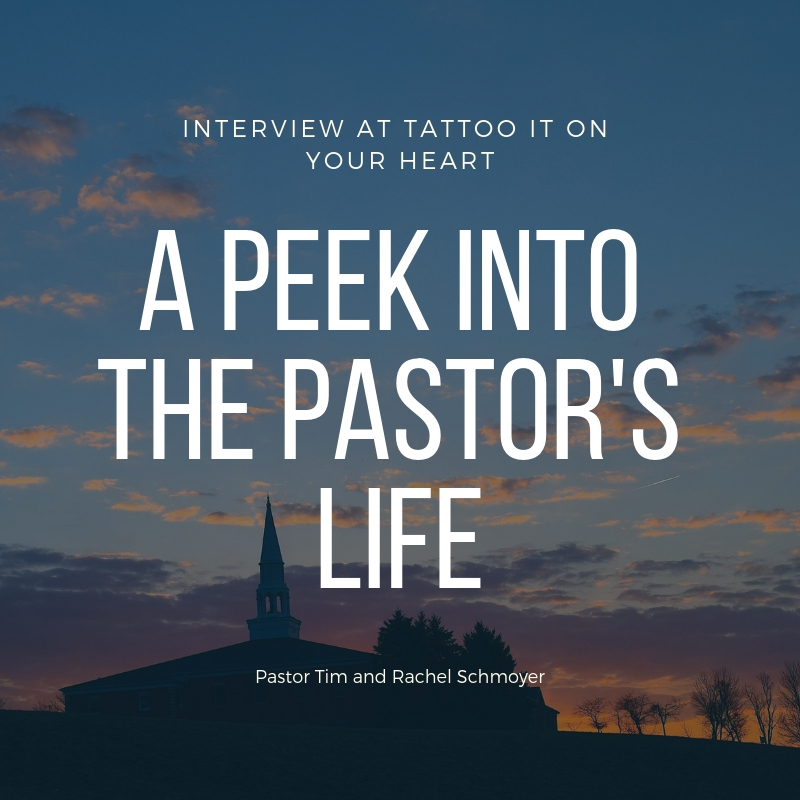 This week Rachael interviewed my husband, Tim Schmoyer, and I. Rachael asked about how God called Tim into ministry, what it was like for us to go right from our honeymoon to our first church, and what gave me the idea to write about the hard parts of Scripture. She also asked about the hard parts of being a pastor and a pastor’s wife and whether or not Tim ever feels like quitting. Read the answers to all these questions and more at Tattoo It on Your Heart. Are you a pastor or a pastor’s wife? Or a pastor’s kid? What would you like people to know about ministry life? What are its ups and downs? How has it affected you? Comment below. I’d love to know!